When student teaching is just about over, you’ll be expected to write a reflection of the experience. With the amount of time and energy that you’ve put into student teaching, you want this to truly reflect your experience. Rather than quickly writing a few paragraphs, take your time to write a well-thought out reflection, taking as many paragraphs and pages as you need to thoroughly explain everything you’ve learned and gained during this time. 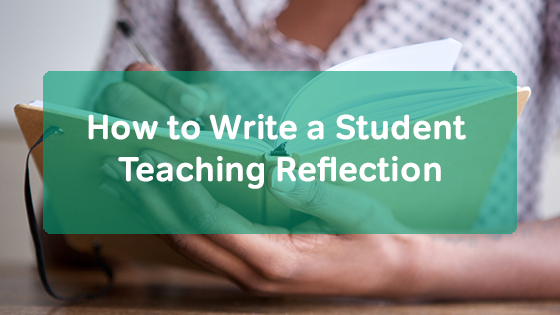 Here are 3 things you can do to help you write your student teaching reflection. It’s important to keep a journal during your time as a student teacher. In your journal, jot down experiences that you have. It gives you the opportunity to think about how you could have done things differently or reflect on the small successes that you see during the day. When you take time to reflect on a regular basis, you have plenty of fodder to use when you sit down to write the final student teaching reflection. During my experience as a student teacher, my university required a weekly journal reflection entered online. I used this assignment to reflect on everything that happened during the week. Then, I referred to these journal entries when it came time to write the final reflection. At the beginning of your student teaching experience, you should have written down your student teaching goals. Did you have specific things you hoped to achieve through the experience? What did you want to work on? What weaknesses were you hoping to strengthen? Look back at your goals, and think about how well you achieved each one. What did you do well? Are there areas that you would like to continue to work on? Also, think about any new goals that you’ll make now based on your student teaching experience. When writing your student teaching reflection, you don’t have to focus on the highlights of the experience. You don’t even need to focus on only the successes or the good days. Let’s face it. Student teaching is full of hard days. But these experiences make you a better teacher, so don’t leave them out of the reflection. Think about the hard days that you experienced and what you learned from them. I’d be lying if I said that I never went home and just wanted to cry after a tough day of student teaching. However, on those harder days, I pushed myself to put on a smile and find ways to help even the unruliest students. As I reflected back on the experience, those days tried me as a teacher, pushed me to improve, and helped me realize that the successes were all the more worth it in the end. After thinking about these things, sit down and create a brief outline of everything that you want to include. Go through each of those points as you write out your reflection. Include anecdotes and lessons that you learned as you reflect on those experiences and your overall teaching experience. In the end, you may learn even more about yourself and your teaching abilities as you reflect on everything that you’ve done.